1. 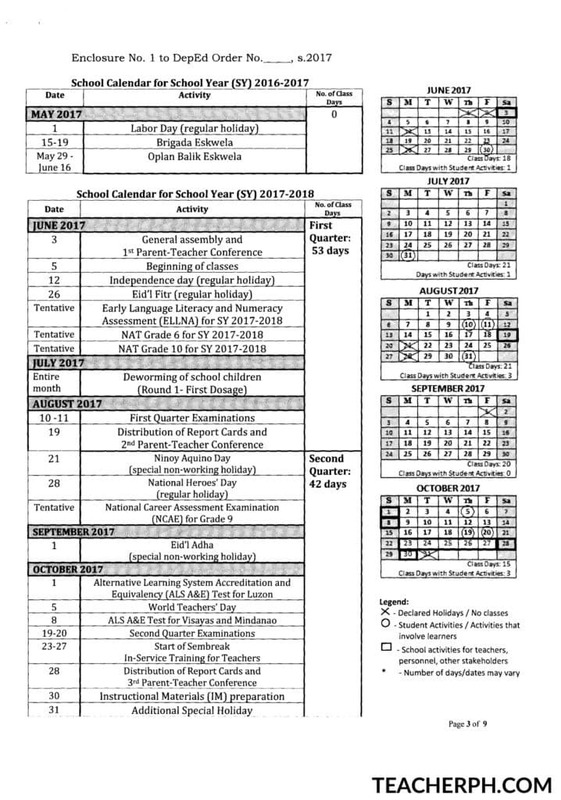 The school year shall formally open on Monday, June 5, 2017 and shall end on Friday, April 6, 2018. It shall consist of 204 school days inclusive of the five-day In-Service Training and four Parent-Teacher Conferences (PTC). 2. Learners are expected to be in school for a total of 195 class days for this SY. To ensure quality in the school operation and actual teaching learning, the 180-day contact time for teachers and learners is non-negotiable. The physical presence of school heads in schools shall also be enforced. 3. Local activities and observances that involve student participation, such as competitions, festivities, press conferences, culminating activities, and field demonstrations must be regulated so as to not cause disruption of classes and to ensure that the required contact time or number of teaching-learning days is met. Regions, Divisions and Schools are encouraged to plan and implement these activities once in a school year or after each quarter. There shall be no co-curricular and extra-curricular activities two weeks before the quarterly examinations. 4. A general assembly shall be conducted by all schools to orient stakeholders on the curriculum, co-curricular programs and ancillary services to support learner development and the continuous improvement of school outcomes. The assembly shall be done at least a week before the school opening to ensure that the conduct of classes is done on the formal opening of classes on June 5. 5. Parent-teacher conferences shall be done to apprise the parents on the performance of their children and ensure their involvement in school activities. These conferences shall be conducted back-to-back with the General Assembly and every second Saturday after the Quarterly Examinations except on the last conference in April 2018. 6. All elementary schools shall administer the Early Childhood Development (ECD) Checklist for Kindergarten Children during the opening of classes, midyear, and end of school year. The result will be used as basis for planning and formulating appropriate interventions for children. 7. Deworming of children in school shall be conducted within the months of July 2017 and January 2018. 8. A career guidance program shall be conducted between July and November 2017 to guide Grades 9, 10 and 11 students in making informed choices on their preferred Senior High School track. 9. At the end of the Second Quarter, a semestral break for learners shall be observed to evaluate individual teachers and their collective performance, as well as to conduct the In-Service Training (INSET) activities for their continuing professional development. 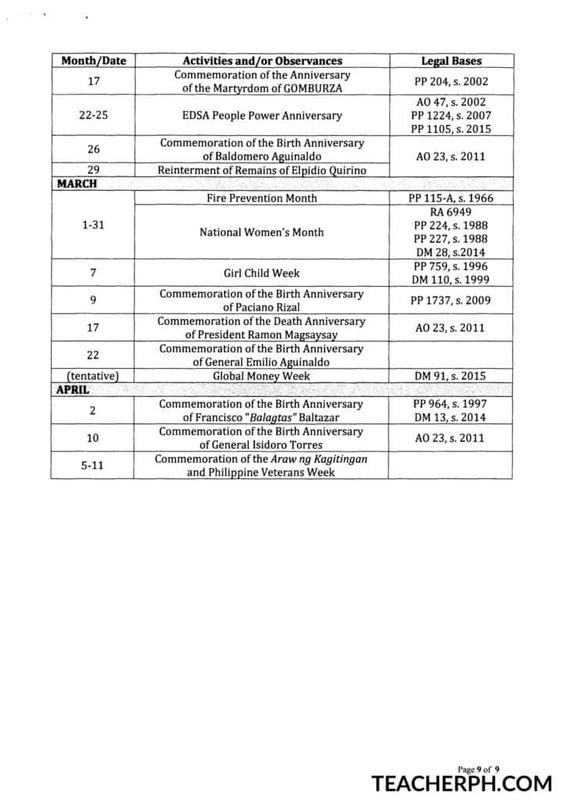 An additional day for Instructional Materials (IM) preparation shall also be observed. 10. The Christmas break shall begin on Saturday, December 22, 2017. Classes shall resume on Wednesday, January 3, 2018. 11. To assure quality of learning, formative assessments shall be regularly conducted by the teachers. On the national level, the Bureau of Education Assessment (BEA) shall administer the National Career Assessment Examination (NCAE) to assess the aptitude and interest of students and provide them with relevant information on their skills, abilities, and readiness for academic and non-academic courses, the Early Language Literacy and Numeracy Assessment (ELLNA) to measure the literacy skills of the learners in their respective Mother Tongues, Filipino and English and the National Achievement Test (NAT) to measure what learners in Grade 6 and Grade 10 know and can do in five learning areas. 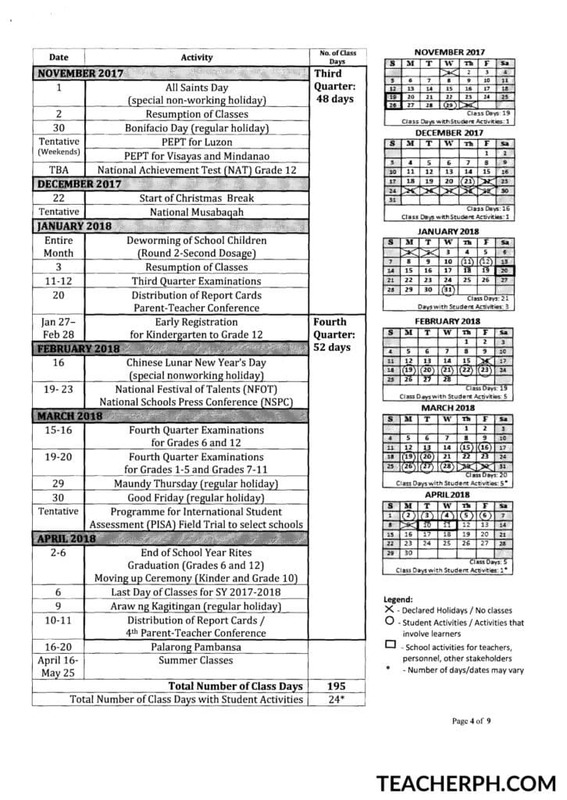 The summer/remedial classes shall begin on Monday, April 16, 2018 and end on Friday, May 25, 2018.
b. Learners who are candidates for graduation. They shall accomplish their clearance one week prior to date of graduation. d. In-Service Training (INSET) activities for teachers from May 28 to June 1, 2018, a week before the opening of classes. 14. In Enclosure 1, a calendar is presented with specific markings. b. Days with school activities for teachers, personnel and other stakeholders (e.g. PTC, general assemblies, PEPT for out-of-school learners) are boxed (^). c. Days with student activities or activities that involve student participation (e.g. NAT, NFOT, NSPC, deworming of school children) are encircled (0). These activities are conducted on class days and may or may not disrupt classes. 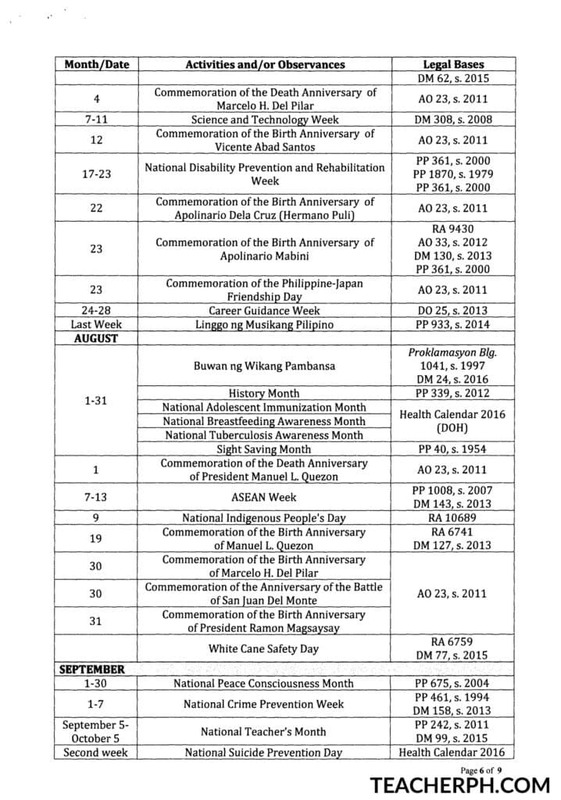 If the date for a student activity in a specific month is still tentative, the last school day is temporarily marked to serve as a placeholder. A few things i have continually told folks is that when searching for a good on the net electronics retail store, there are a few aspects that you have to factor in. First and foremost, you want to make sure to discover a reputable and in addition, reliable retailer that has got great opinions and classification from other people and business sector professionals. This will ensure that you are getting along with a well-known store providing you with good service and support to its patrons. Many thanks sharing your opinions on this site.